So, it’s time to update your shower. You’ve picked out your fixtures and decided on your tilework. Now, you need to decide how you want to enclose this area. You might be tempted to choose a shower curtain and call it a day. But after all those tough decisions and hard work, it seems a bit silly to hide it all behind some musty fabric. Seamless glass shower doors are a stylish solution to give your shower the upgrade it needs. 1. Seamless Glass Doors Display Your Shower’s Features. If you’ve chosen to use tile for your shower, you know that it can take hours and hours to complete a small space. Why hide that beautiful work? While framed-in doors can partially solve this issue, the metal will still obstruct the view. A seamless glass door allows the best view. St. Louis Glass Works is able to customize a seamless door that will perfectly fit your space to show off your design. 2.Seamless Doors Create More Space. Seamless glass doors open up an area, allowing your bathroom to look more spacious. Instead of isolating the shower area, a glass door incorporates it into the rest of your bathroom, letting it become a standout feature. Having a seamless door without frames or curtains will prevent the area from feeling so claustrophobic, making your experience much more relaxing. 3. Glass Doors Allow More Light. Adding in an above-shower light can be costly and complicated, but installing a shower curtain and neglecting the light darkens the area. This can be frustrating! Shaving in the dark can be a little dangerous, and mixing up bottles of shampoo or conditioner is a bad way to start your day. Glass doors eliminate the need for adding light by allowing outside light to stream in so you don’t have to strain your eyes while washing off. Let’s be honest: when was the last time you cleaned your shower curtain? It can be a pain, but without regular washing, curtains can get dirty. The humidity is the perfect invitation for mildew and mold. Similarly, framed-in doors can rust. Seamless glass doors are an easier, more hygenic option. Keeping a squeegee by the shower lets you quickly wash off any buildup while you shower, cutting back on time and offering a practical way to keep an area you frequently use looking spotless. 5. Seamless Glass Doors Improve Your Home Value. Seamless glass doors are an especially smart option if you’re trying to figure out how to increase your home value. It’s a simple way to pack in a huge upgrade! Seamless glass doors look both timeless and stylish. You don’t have to worry about the metal of the frame falling out of favor and instantly aging the room. For the modern househunter dealing with dozens of virtual house tours on their phones or laptops, an elegant shower might be the push they need to schedule a showing. Seamless glass shower doors are a great way to upgrade your space and make your shower stand out. By choosing to install one, you can create the feel of a larger, airier space while showing off the shower you worked so hard to make perfect. 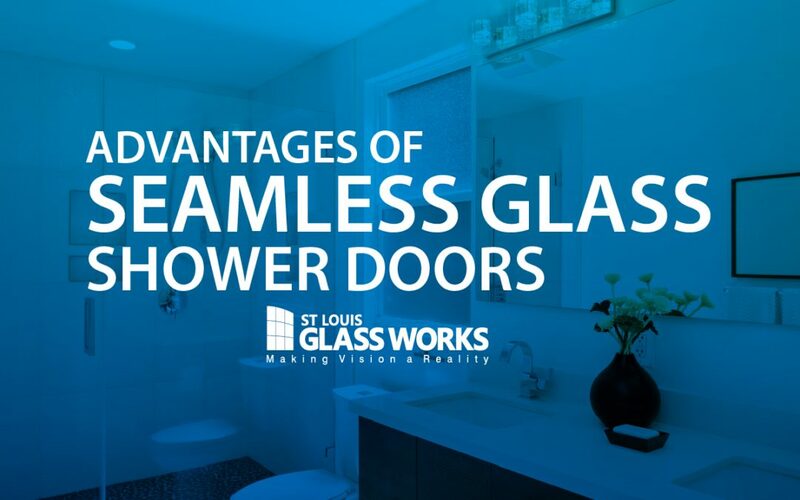 St. Louis Glassworks can provide you with a beautiful, customizable seamless door that will put your shower over the top!